There’s been a lot of interesting conversation this week about the usage of public spaces, manifesting – as always – online. The spark that lit the fuse on this particular e-furore was the the actions of a local graffiti writer, Nost. Who painted over a mural in Northcote – ‘Bomboniere to Barbed Wire’. The mural, painted in 1986 by Eve Glenn and Megan Evans, was a celebration of the female experiences in what was then a working class suburb. Much of the discourse surrounding this action has focused on the idea that Nost targeted the wall as a show of anti-feminist sentiment. In order to erase the experiences and voices of the migrant women that the mural sought to commemorate. The original mural, as it stood in 1986. Graffiti, particularly to outsiders, is an obtuse culture. There’s not much to equate it to in terms of traditional pursuits, so it’s understandably alien to a large portion of the population. By and large, the public ignores graffiti until they’re forced to pay attention to it. Say, if someone tags your fence – or if someone executes something on such a large scale that you’re forced to interact with it. Inevitably, when this occurs there’s an outcry. Why? How? Who? The most frustrating part of this experience for the aggrieved is the fact that there questions by and large don’t get answered. The anonymity of the culture defies explanations, no matter what you demand of it. It’s a power of the action, it’s insular by definition. There’s scant documentation of graffiti practise available for consumption by the public – outside of the finished product. The Keith Haring mural in Collingwood in 2015, prior to restoration. Of course, Nost isn’t the first person to cross the invisible barrier that catapults graffiti writers into public notoriety. Prior to this it was the theatrical outrage following the vandalism of a long standing mural by Keith Haring, just up the road in Collingwood. The debate surrounding this incident was particularly ironic, considering Haring had a longstanding relationship with graffiti and graffiti writers, and often worked outside in ephemeral mediums. Before this, in the mid-00s it was the notorious 70k crew. The group who ‘agitated the city’ (to borrow a phrase from the legendary Barry McGee) to the point where the state dedicated considerable resources to ensuring that they were stopped. This all seems well and good on paper. Graffiti is, of course, illegal. Any long standing graffiti writer accepts this as part of the overall landscape of the practise. It’s a fundamental dimension of the culture, deterring some who would otherwise be inclined to write on walls – and acting as a motivation for those who choose to pursue that particular course of action. In this context, public reaction is to be expected. But things rarely exist within such a vacuum. The state of Victoria has a complicated relationship with graffiti that muddies the water when it comes to issues like this. When you arrive at baggage collection at Melbourne International Airport, you’re greeted by a large scale photo print of Hosier lane – the inner city laneway celebrated for its graffiti. If you jump on to TripAdvisor and search for things to do in Melbourne, you’ll find that a trip to the lane is ranked number 30 out of 317 local sights and attractions (4.5 out of 5 stars, based on 825 reviews). Our city is often celebrated for its laneway culture, a phrase that’s inclusive of graffiti – or at least its more hermetically treated nom de plume, ‘street art’. Graffiti is linked to the city’s wider identity, and that in turn translates to tourism and dollars spent. Of course, it’s not just that particular destination. It’s also the cottage industry that’s sprung up around Melbourne graffiti culture. It’s the laneway tours. It’s the prints. It’s the books. It’s the throw pillows. It’s the iPhone apps. It’s the thongs. It’s every privately commissioned, culturally stagnant mural. A tourist laments “talentless taggers” in Hosier lane. The idea of trading off the capital of a culture that’s based on illegal expression is inherently flawed. The origin of graffiti ethos is freedom, in both expression and action. It’s primarily about the subversion of limitations placed upon its practitioners. To try and regulate and control that expression is antithetical to the notion of its existence. The public doesn’t get to decide which parts of the culture they embrace, and which ones they reject. Graffiti has always been a practise for outsiders. Writing itself is a political act, but not in the sense of a coherent or manifested ideology. It’s a testament to defiance, and an embracement of alternatives. Graffiti is an aesthetic expression, sure, but the actual product is just the manifestation of a myriad of other factors. What’s left on the surface of a wall or train is the culmination of lived actions, a talisman of those experiences. A sign in a Fitzroy back alley. Public perception of graffiti culture in Melbourne seems to rest on arbitrary aesthetic value judgements. It’s the often repeated line, “I like the colourful stuff, I just can’t stand the tags.” What’s overlooked is the fact that you can’t have one without the other. They’re two sides of the same coin. As a state, Victoria champions this visual identity for its largest city, yet enforces incredibly harsh punitive measures against graffiti writers. In Victoria, police can search any person on the suspicion that they may be carrying an ‘implement of graffiti’. If items are found, it’s up to the individual to produce a ‘lawful excuse’ (these terms are not defined in the relevant legislation, The Graffiti Prevention Act 2007) as to why they’re carrying them – or face a fine of up to $3,791. This is a state that actively seeks to jail young graffiti offenders, yet runs tourism campaigns that feature the work of Phibs –underscored by the twee harp-plucking of Joanna Newsom. Funnily enough, Brisbane-born graffiti writer Sofles and his longterm collaborator Selina Miles released their latest video project, Wayfarer, the same week that the Northcote mural was capped. 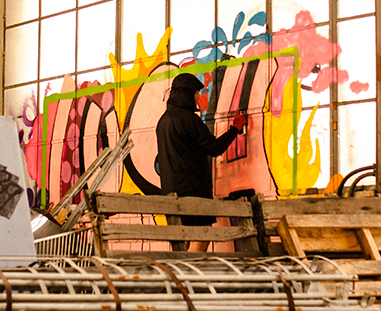 It’s a love letter to Collingwood and Fitzroy, and the graffiti culture that they embody. Technically and aesthetically impressive, the video captures the spirit of the twin suburbs that are so often linked to the wider Melbourne identity. Sofles is undoubtedly a master graffiti practitioner, and deserves every single bit of credit that he gets as an artist. If I were making an argument to the aesthetic worth of graffiti, or I was trying to explain it to my mum, this is the video I would show. But I’m not. Both Wayfarer and Nost’s wall exist on the same cultural spectrum – and the public doesn’t get to define which expression they prefer. Do I think that it’s a shame that ‘Bomboniere to Barbed Wire’ was damaged? Absolutely. Does that matter? Not at all.